I recently read an article that addressed the effects of cleaning products on the lungs of women. And, you guys, it’s not good. After following 6,000 participants for 20 years, women who regularly used cleaning products were found to have the same decline in lung function as those that smoked 20 cigarettes per day. What?! This is why it is so important to find cleaning products that are natural and don’t contain those harsh chemicals… Some think going natural in their cleaning products means spending a ton of money, but that doesn’t have to be the case. 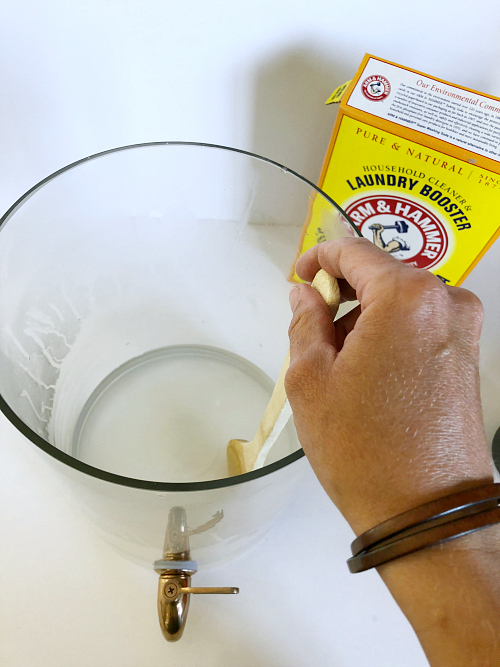 Check out this DIY laundry detergent that costs 7x less than what you’d buy at the store. 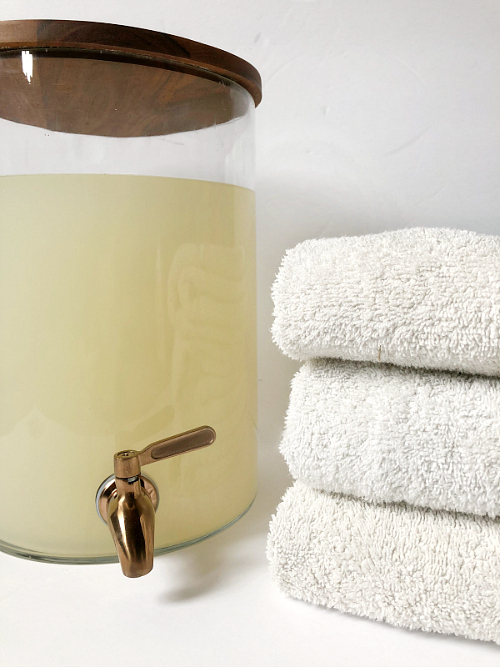 I have been making my own laundry detergent for years, and have loved almost everything about it… but there was one little part I wasn’t a huge fan of, and that was the need to grate soap into the mix. 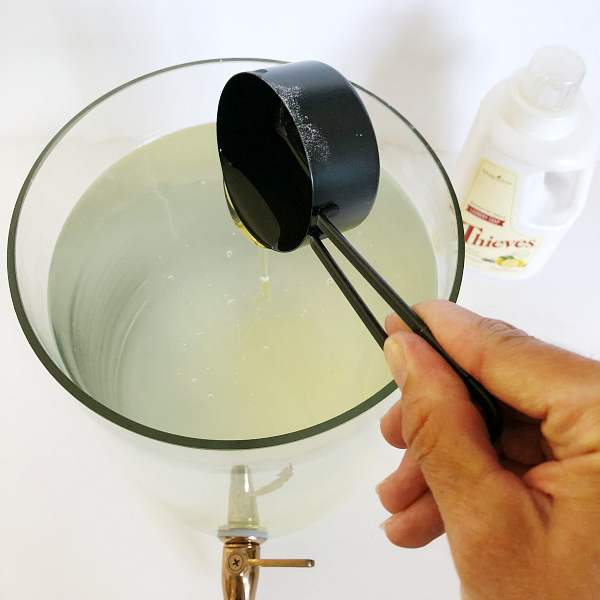 It isn’t super difficult, but it makes a mess, and you really need to wash your clothes in warm or hot water to ensure the soap fully dissolves. I was willing to overlook this for the past 3 years because the batches I made would last forever, and it did a fine job of getting my clothes clean. (You can find the recipe here if you are interested). But then a friend of mine posted a recipe for a liquid laundry soap that required zero soap grating and was super budget-friendly. As always, I did a little research and tweaked the recipe a bit, and then I actually tried it out for awhile. After loads and loads of laundry, I can say, with confidence, I will be making this my new go-to. I love that everything in the recipe is void of harsh chemicals, and even better, it costs a fraction of what you’d pay for laundry detergent in the store. (Cost breakdown at the end of this post.) Ready for this awesome recipe? The recipe below will make one gallon, you can certainly double the recipe (like I did) if your dispenser is larger. 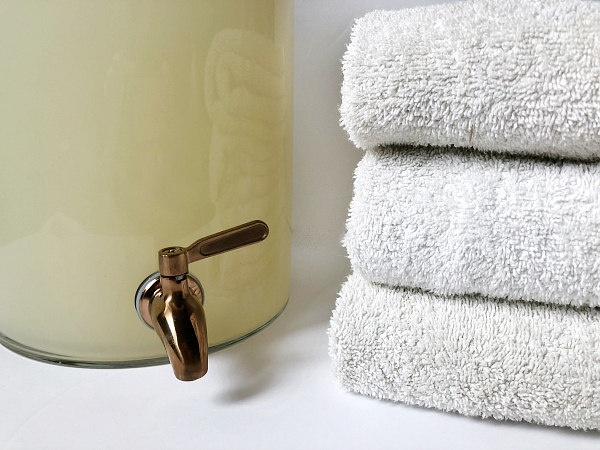 Hot Water- You may want to use distilled water to avoid impurities that naturally occur in tap water. Ready for the easiest tutorial ever? Start by pouring 1/4 cup Washing Soda into your dispenser (or stock pot). Add enough hot water (not boiling) to cover by an inch or two and stir until the washing soda has dissolved. 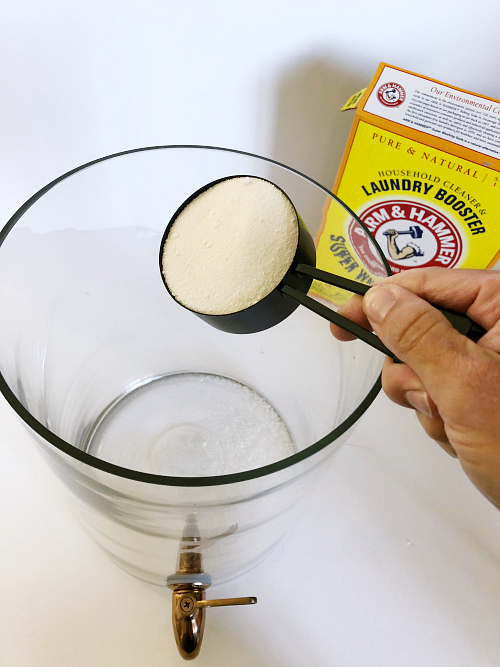 Once your washing soda has dissolved, add 1/4 cup baking soda, and, once again, stir until dissolved. At this point, I would highly recommend placing your dispenser where you plan to keep it, as it gets a bit heavy. 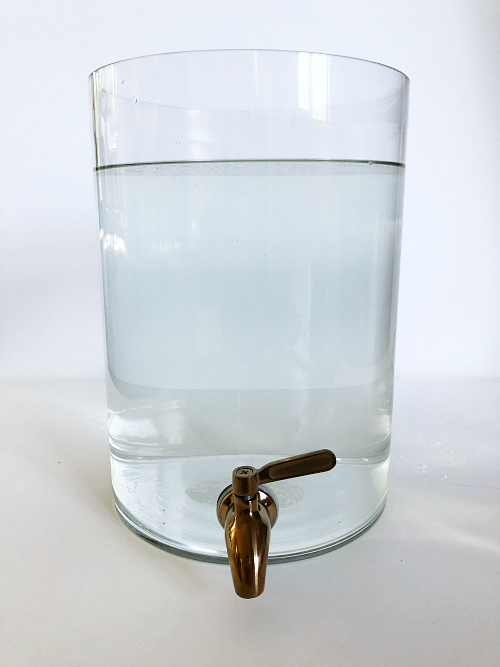 When adding water, simply using a pitcher or jug. Also… if you performed steps 1-3 in a stock pot, at this point, pour the mixture into your dispenser once cooled. Fill your dispenser with warm (room temperature) water, allowing some room at the top to add a few more ingredients. First add 1/4 cup Thieves® Laundry Soap. 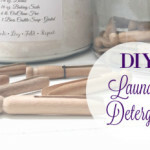 I have seen similar recipes done with Castile Soap, but I love the idea of using an actual laundry soap instead (and others have reported that the Castile Soap gets chunky and dispensing becomes difficult). 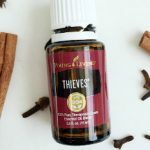 Plus, the entire line of Thieves® products smell amazing! Next add 1/8 cup (or 2 Tablespoons) of Thieves® Household Cleaner. This plant-based cleaner is highly concentrated and requires diluting when using as a cleaner… the 14.4 oz. bottle actually makes 29 bottles of household cleaner*! *Based on using a 16 oz glass spray bottle and following instructions for “Most Cleaning Applications”. 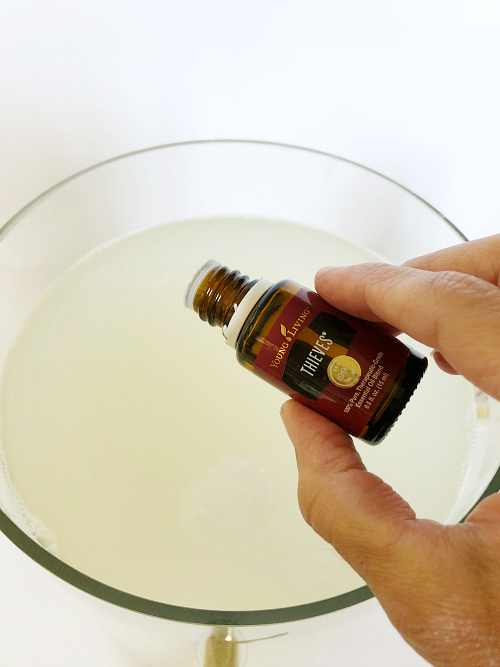 If you want to enhance the scent of the detergent a bit, feel free to add a few drops of essential oil. 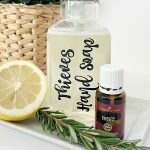 I chose to add Thieves® and Lemon (2 of my favorite essential oils for cleaning 🙂 ). A couple drops of each is all you’ll need. All you have left to do is give it a little stir, and you’re good to go. When doing laundry in a HE washer, use 1/4 cup per load. UPDATE: If you notice the laundry soap separating (the laundry soap settling to the bottom), just give the mixture a little stir. I actually didn’t notice this happening until it had been sitting on my counter for about 2 weeks, but others are reporting this happening after a short period of time. I just leave a wooden spoon next to my dispenser and give it a quick stir if I notice any separation. When using 1/4 cup per load, this equals 6-7¢ per load. *Wholesale pricing is available to members of Young Living, however, you also have the option to buy retail. 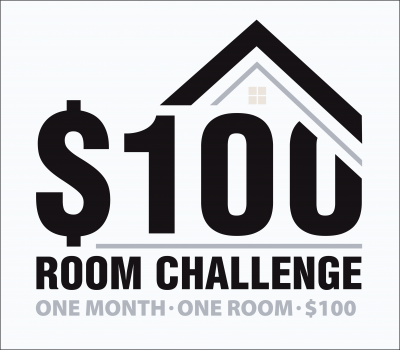 (Get more details here.) If buying retail, the price of the Laundry Soap would increase to $2.43 and the cost of the household cleaner would increase to $2.06; increasing the price per gallon to $4.76 (without essential oils added) and the cost per load would be 7¢/load. For the printable version of this recipe (plus answers to the most frequently asked questions about this recipe), click here. Hi! Might seem like a silly question but I wanted to double check. For HE washers, do I put the soap straight into the drum or does it go where the soap usually goes, in that little receptacle thing? Thank you so much! I always put mine into the soap receptacle. The recipe, as written, requires just under one gallon of water. Basically one gallon minus one cup. how much actual water do I add? A gallon? How much water do u use for all this? How does it stand up to grass and more heavily soiled clothes? Just as I do with any detergent, I treat stains like grass, soil, and oils with my DIY stain remover. My boyfriend doesn’t like the smell of thieves(I know. He’s crazy) any substitution ideas for the thieves products in this recipe? Whenever I add the baking soda to the washing soda mixture.m, it doesn’t dissolve at all. 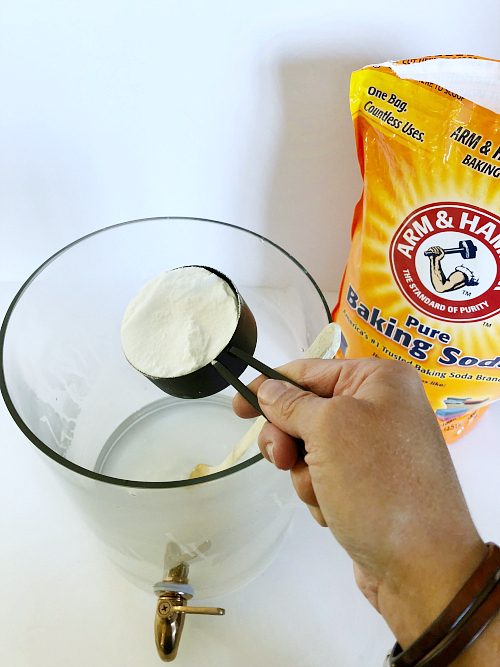 The baking soda makes a giant rock solid clump and will not mix in. Any suggestions? I just made mine for the first time. I would just make sure the water is hot and slowly add a little baking soda at a time and stir till dissolved and see if that helps. This seems to be a common issue, yet I have never had it happen to me. I would recommend making sure you have enough water (1-2 inches above the washing soda) and make sure it’s hot. Also, be sure the washing soda is completely dissolved before adding the baking soda. Hope that helps. Tried to make this, but twice now when I add the baking soda to the dissolved washing soda (and other way around the second time) they react and I end up with what looks like rock salt. Not sure what I’m doing wrong. I did make my washing soda myself (baking soda in the oven at 400 for an hour makes washing soda), but it sounds like someone else in this thread had the same issue. How do I keep this from separating? I am making my third batch right now and the first two I made both separate. It is just slightly annoying to have to stir the detergent before every load. Thanks! What did I do wrong? My baking soda is clumping and won’t dissolve. Hi Erin. I wonder if you mixed/combined the THC, laundry soap, essential oils & a little bit of sea salt first & then added it to the washing soda/baking soda mixture if that would help emulsify the oils so that it wouldn’t separate. Not sure what ingredients were separating but I was just curious what you thought. Excited to try this recipe!! Do you have any suggestions for someone who can’t use Thieves? I’d love to make this, but rosemary and eucalyptus are contraindications for a medical condition that I have. I know there are some recipes that use Castile soap, however, I had heard it gets pretty gloppy and thick. I haven’t personally tried it, so I don’t know for sure. I have recently found your blog and absolutely love it!! 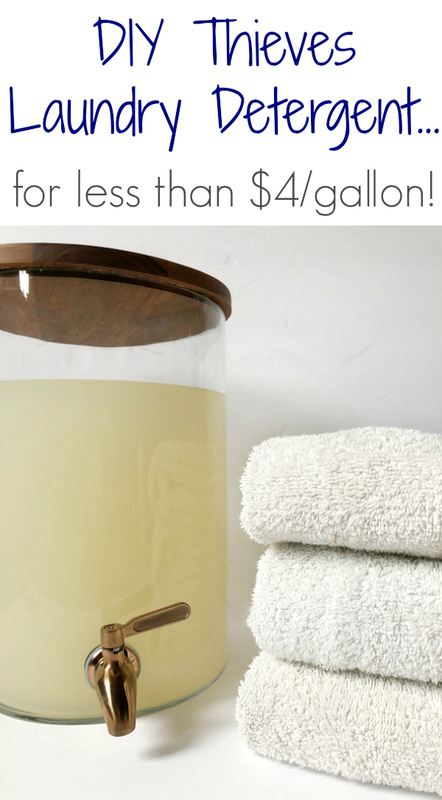 This post is the first one I read, I’m curious if one could use Castile soap instead of Thieves Laundry Soap? I really want to give this recipe a try but the Thieves Laundry is so expensive! 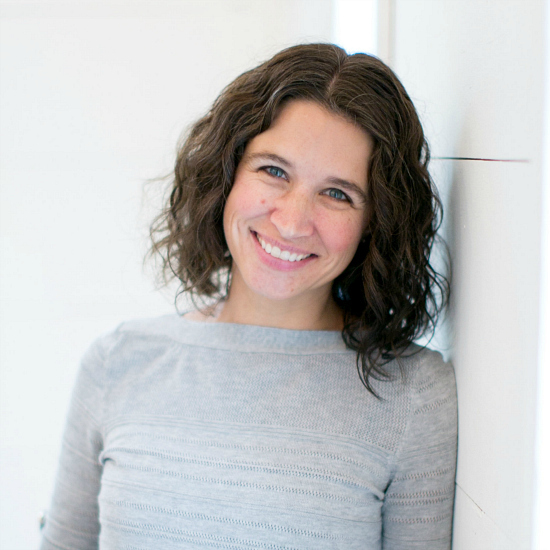 Thank you for your amazing, inspiring blog!! I’m also looking for an alternative to thieves. I just found that Mrs. Meyers has a concentrated laundry detergent, too. The concentration is different though- thieves is 1/2 oz/load while Mrs. Meyers is 1 oz/load. So I’m thinking we can make this recipe, substituting 1/2 cup Meyers for the 1/4 cup thieves. It looks like thieves is about $37 for a 64 load bottle, and Mrs. Meyers is about $16 for a 64 load bottle. I have heard of recipes that use Castile soap, however, many complain that the soap gels and gets very thick and gloppy. I haven’t tried it, so I don’t have any experience with it. is the housecleaner diluted or straight from the bottle? Can I use this with cold water or is it best in warm or hot? This should be fine to use in any temperature setting. What can you do if you have an allergy to baking soda? If you can use washing soda (I think the chemistry is very similar to baking soda, so I’m not sure if it’s okay for you or not) I would double the washing soda and eliminate the baking soda. Could you tell me how this detergent works with bad stains (blood, grass, pen etc..) ? For those types of stains, I will recommend treating with a stain remover prior to washing. However, I would do that no matter what laundry soap I was using. For pen, I tend to use rubbing alcohol to spot treat. (I have a bottle that is 70% alcohol) As far as more protein based stains, (blood and grass) I tend to use the Thieves Household Cleaner at the concentration that I use normally (general household cleaning) as my spot treat…You may have to treat a couple of times – OR you can also soak in Borax or Biz overnight. I don’t see any mention of high efficiency washers, unless I missed that part. Can this be used in my front-loading HE machine? Yes. The recipe above is written for HE washing machines. Can this be used in HE washers if so, how much? I use it in my HE washer. 1/4 cup/load. I may have missed it, but, how much laundry detergent do I use per load? I use 1/4 cup/load in a HE washer. If you have a large load of laundry, do you need to add more then the 1/4 cup of laundry soap? Also, does the amount added per load differ if you have a non-HE Machine? Thanks for the recipe and the break down, I so appreciate it! I used the 1/4 cup for large loads. If you have a top-loading washer, you will probably need more, as more water is being added to the washer. 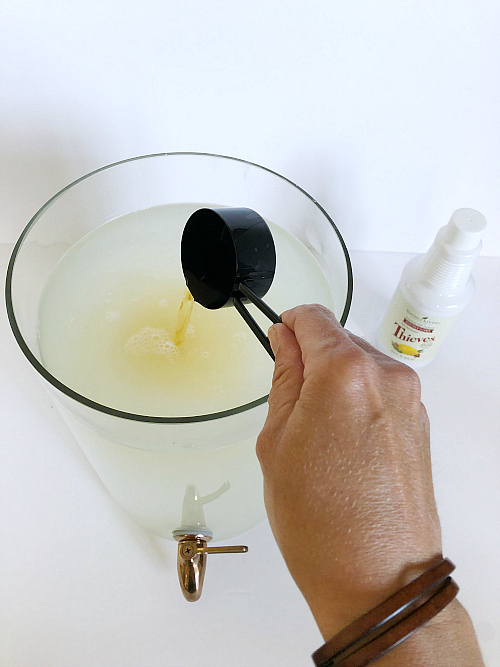 Most top loaders use twice as much water as HE, so I would guess you’d need about 1/2 cup if using a top-loader, but you can certainly experiment with lesser amounts. The recipe listed do I just need to double that to fill my 2 gallon jar? Where did you get your laundry dispenser? This recipe makes my heart so happy. 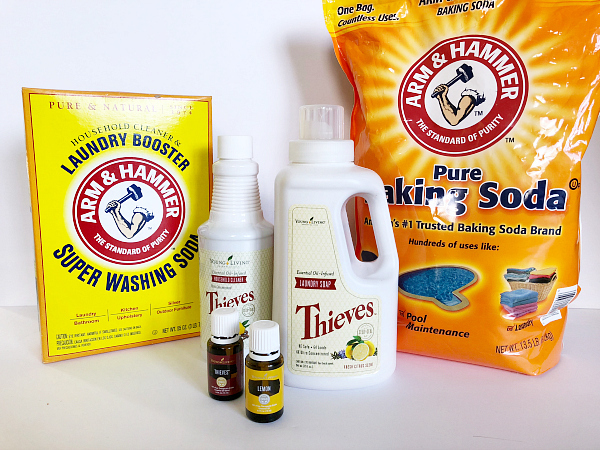 I’m already adding a capful of Thieves cleaner to every single load of laundry I do with a store bought detergent. I can’t wait o make this and start using it!!! 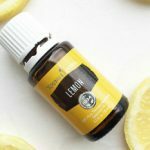 I am going to try this but I do not like the idea of using a household cleaner in the recipe. Do you think it work well without it? I’m thinking about replacing it a natural laundry booster powder. And thoughts on how well that would work? If you would rather not add the cleaner, I, personally, would try doubling the amount of laundry soap and see how that works for you. How about borax in place of washing soda? I haven’t tried the recipe with Borax, although Borax and Washing Soda do the same type of thing for laundry. Would you use the same amount of Borax as soda? Is it necessary to use the glass for dispensing? Could it be put into used laundry detergent bottles? 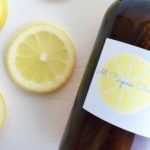 If you’re adding any citrus essential oils (like the lemon she uses) they will break down plastic so glass is a must. It would be great if you could print out the recipe to keep in a folder to use when making a new batch. 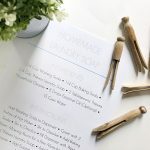 Did you see, she created a printable and it is on the next blog post!